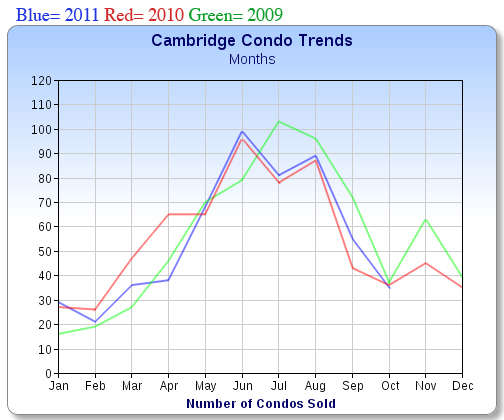 Cambridge Summary: Inventory for October continued to decline, dropping 45% compared to the same period last year. ~ Condo listing $ volume is considerably lower by 48% from 165 million to 85 million. 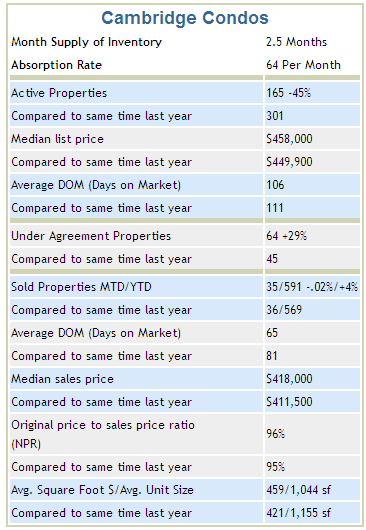 ~ The median list price increased slightly by $9,000 with properties selling an average of 5 days faster. ~ Condos that went under agreement for the month increased by 29%. Condo sales for the month were flat in comparison down .02%. 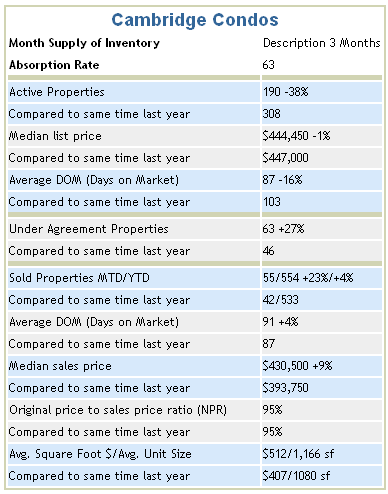 ~ Year to date sales were up almost 4% or 22 more condos than in October last year. Cambridge condo sold $ volume for the month was flat loosing only -.02% a difference of $471,800. YTD sold $ volume is up 4.73% over last year. 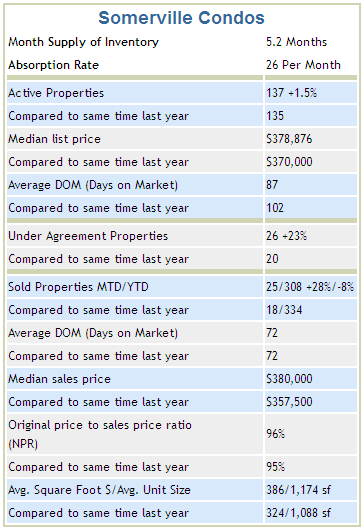 ~ The median sale price improved by 9% with the ratio of sale price to original price the same at 95%. ~ The average square foot price for October was $459 per square foot with the average living area at 1,044 sf, 111 fewer square feet than in 2010. 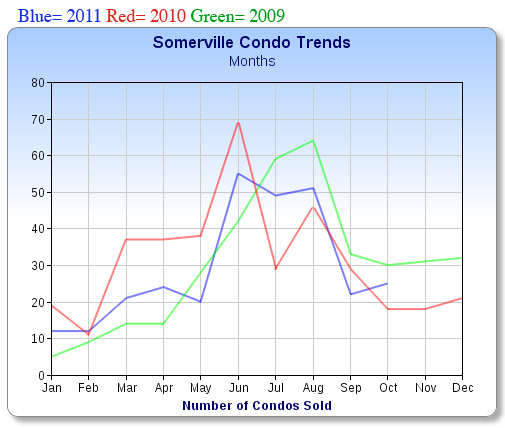 Somerville condo sold $ volume went up by 34% from 6+ million in 2010 to over 9 million this past October. YTD sold $ volume remains behind by nearly 4% compared to last year at the same time. 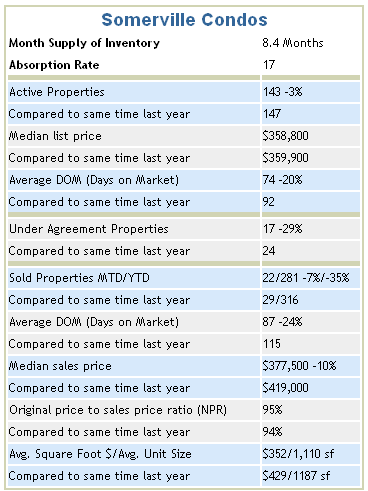 ~ Sold average days on market remained the same at 72 days. The original price to sale price ratio tightened a point to 96%. ~ The average square foot price rose to $386 per square foot for October with the average condo size also increasing 86 square feet to of 1,174 square feet. 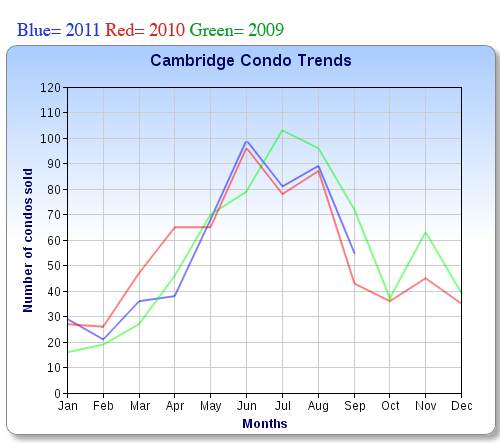 Cambridge Summary: Inventory for September dropped 38% compared to the same period last year. ~ Condo listing $ volume is down considerably by over 41% from 166 million to 97 million. ~ The median list price fell slightly by $3,550 with properties selling faster at 87 days on average. ~ Condos going under agreement for the month increased by 27%. ~ Sales for the month increased more than 23%. 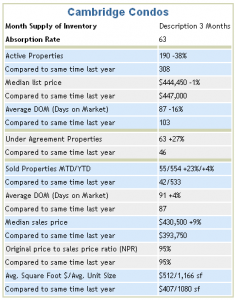 ~ Year to date by +4% or 21 more condos than in September last year. 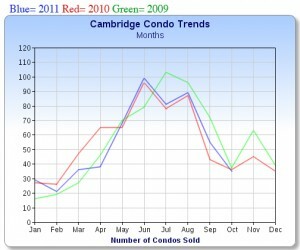 Cambridge condo sold $ volume was up over 35% almost 10 million from 18 million in 2010 to 28 million this past September. YTD sold $ volume is up 4.73% over last year. 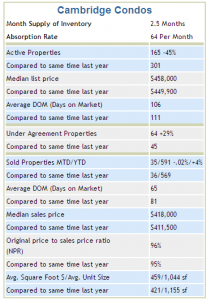 ~ The median sale price improved by 9% with the ratio of sale price to original price the same at 95%. ~ The average square foot price for September was $512 per square foot with the average living area of 1,166 sf. 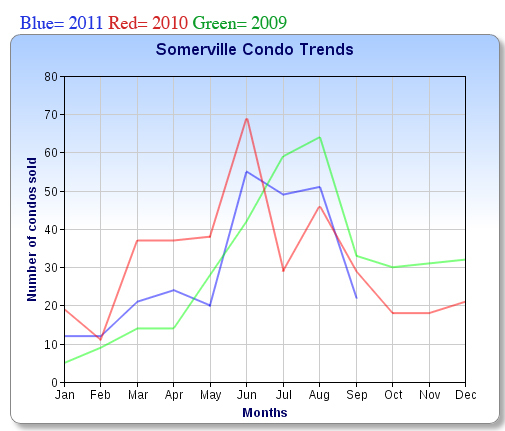 Somerville Summary: Condo inventory in Somerville is about the same as last September but down 3%. 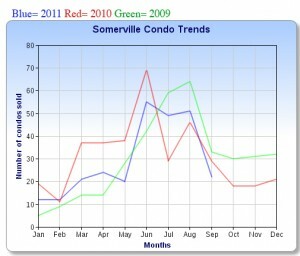 ~ The median list price shows the same with a slight increase of $1,100 with the active days on market showing more demand by improving to 74 days from 93 in 2010 ~ Condo listing volume or market value at the end of September decreased by nearly 2% from 58 million in 2010 to 57 million for September 2011. Condos going under agreement decreased by 7, or 29%. ~ Condos sold for the month was down 7% with the YTD number sold falling behind by 35%. 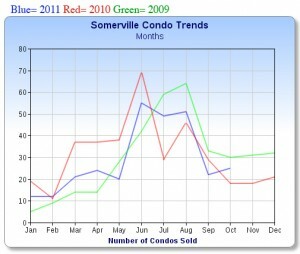 ~ Somerville condo sold $ volume was down by 36% from 12 million in 2010 to almost 8 million this past September. YTD sold $ volume is down 7% over last year at the same time. 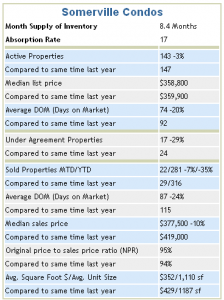 ~ Sold average days on market decreased 18 days to 87 days. The original price to sale price ratio increased a point to 95%. ~ The average square foot price was $352 per square foot for September with the average condo size of 1,110 square feet. We are very excited about our upcoming day trip to Toronto to visit with RE/MAX Hallmark, participate in their 30 year celebration and meet with some their amazing agents. Check out Ken’s video on plans for the day. In essence change is good. Kaizen is a simple method of improvement and awareness. Kaizen evolved as a concept where companies such as Sony, Toyota and others made continuous improvement part of the companies DNA. Their success is legendary. 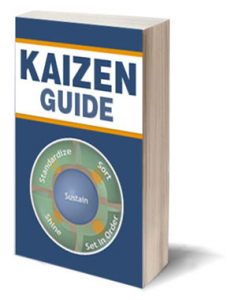 Learn more about Kaizen Improve with Kaizen System, How the Japanese “Kaizen” Method Can Change Your Life. These same principles can be effectively used by individuals, teams and partnerships in building their real estate practice. What are the key components to a successful real estate practice? What can we measure and practice in an effort to achieve the best results in the shortest time? Start by writing out a list of these activities; listing & selling presentations, marketing campaign, lead generation and conversion and others. In essence, define what is standard for what you do in your business. Your current production level does not matter. This exercise is intended to help you see the “big picture” view of your business. Once you are clear on your base line practice(s) you can begin applying the process of Kaizen or continuous improvement. The process is q uite simple and only requires an understanding that the energy in all that you do is to be captured and improved upon instead of lost and dissipated. As the old Chinese proverb says, a journey of a thousand miles begins with a single step. In Kaizen it begins with the understanding that continuous improvement conserves energy and increases momentum. Start: What is the most pressing problem I am having? Define problem area you wish to improve. Choose: What can I do differently to eliminate the problem or reduce its’ impact? Decide on specific changes to be made. Implement: How will I know it’s improved? Make sure you can measure results. Capture: What do I need to do to make this my new standard? Blend into or raise your standard of practice continuously. Think of the process as a constant and continuous upward spiral. It never stops. The process is forgiving not demanding. You can come in and out of its focus as you wish. There is no consequence to returning to the process should you drift away, only a stronger understanding of the value in its simplicity. 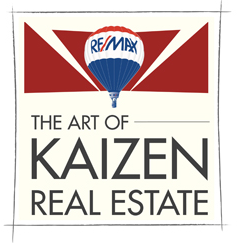 Personally, Kaizen has helped save me from trying to be perfect instead of effective. I like to call myself a “recovering perfectionist”. The perfectionist has a tendency to over analyze and in essence procrastinate instead of taking action and learning by experience. Through Kaizen I have learned to handle many more activities and projects than I would have ever imagined. I see all that I do as a large wheel or spiral of improvement where I strive to get a plan into action sooner rather than later. Remember, time is of the essence, just like in real estate. The more time that passes the less likely you are to follow through. As a Broker/Owner of a growing 40+ person company I have a strong desire to provide the very best in support, service and personal development. So I now work with a “Done is Better” attitude knowing that once I get the project into my cycle of activity I will evaluate it to see if I can improve it and therefore raise the effectiveness or perhaps simply let it disappear. Kaizen can be practiced by anyone often in less than ten minutes. It can have a lasting and dramatic effect on how things get done. It centers on personal accountability and honesty. If in a team or partnership, add the expectation that everyone involved will take responsibility for their contributions to help define efficiency and effectiveness. It is awareness that all you do can and should be improved upon, ideally using energy that is already in motion. It is a process of compounding and increasing positive energy. Let kinetics work for you. See your practice as a series of strategies where you test and apply measurable tactics to move you ever faster forward toward your goals and dreams. Think of the four steps as a quality improvement circle. You need to complete all four for maximum impact or improvement. When you identify a problem write it down so that you can complete the process at a time where you can really focus on it. It might be an improvement to a presentation, a soft close technique or any number of realizations. Get the most out of your efforts. Build a positive business cycle of continuous improvement that recycles your energy into ever greater success and joy.